Craig Denison is the author of First15, a daily devotional guiding tens of thousands of believers into a fresh experience with God’s presence every day. He writes, speaks, and he and his wife, Rachel lead worship to help believers establish a more tangible, meaningful connection with God. You can check out his work by signing up to receive First15 every morning for free, and by engaging with First15 on social media. Dr. Randel Everett is founding President of the 21st Century Wilberforce Initiative. Everett has spent four decades pastoring churches, most recently as the senior pastor of the First Baptist Church of Midland, Texas. During the past two years with 21CWI, Everett and the Wilberforce team have been to the front lines of Iraq just 1.5 miles from ISIS held territory and traveled throughout the Middle Belt of Nigeria witnessing the atrocities committed by Boko Haram and the Fulani Militants. Reports from these two trips include Edge of Extinction (Iraq) and Fractured and Forgotten (Nigeria). They have been translated in numerous languages and have become trusted resources by government, NGO’s and religious institutions. These reports have been the featured documents by the American Enterprise Institute, the Hudson Institute, the Woodrow Wilson Center, the Holocaust Museum and the Newseum. Congressman Frank Wolf joined the staff of 21CWI upon his retirement from Congress. 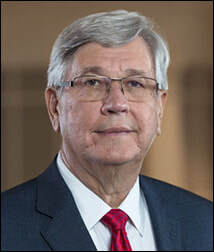 Everett served as Chaplain to the Arkansas Legislature during President Bill Clinton’s term as Governor, as Chuck Colson’s minister while pastor of the Columbia Baptist Church in Falls Church, Virginia, and as Executive Director of the Baptist General Convention of Texas. Everett founded the John Leland Center for Theological Studies in Falls Church, Virginia. During his time as leader of Texas Baptists the Baptist General Convention of Texas had 5500 churches including more than fifty different ethnic groups. The BGCT also includes nine educational institutions including Baylor University, four child service institutions including Buckner International and Baptist Family and Child Care that provides care for hundreds of immigrant children who come into the country through the Mexican border without parental supervision. Religious freedom has always been a priority for Everett. When he was the founding president of a new seminary in the DC community he recommended it to be named for the Virginia Baptist pastor John Leland who was most instrumental in persuading James Madison to include religious freedom in the US Constitution. The 21st Century Wilberforce Initiative was named for the 19th Century British Parliamentarian who led the effort to abolish slavery. As a leader in the Baptist World Alliance, Everett has met with religious and government leaders and spoken to congregations in over 40 different countries. He was the Chair for the 2015 BWA Congress in South Africa that was attended by thousands of Baptist leaders from around the world. In 2014, Everett announced he would step down from the pulpit to pursue the 21st Century Wilberforce Initiative so he could shed light on both religious persecution abroad and the chipping away of religious freedom here in the United States. Pastor Everett’s church in Midland has taken in religious refugees fleeing persecution in China and Ethiopia. Before his time as senior pastor there, he was the senior pastor of many churches, including: the First Baptist Church of Newport News, Virginia; Columbia Baptist Church in Falls Church, Virginia; First Baptist Church in Pensacola, Florida; and University Baptist Church in Fort Worth, Texas. Everett earned his B.A. from Ouachita Baptist University in Arkansas, his Master of Divinity and Doctor of Ministry degrees from Southwestern Baptist Theological Seminary in Fort Worth, Texas and received two honorary degrees including the Doctor of Divinity from the University of Richmond and the Doctor of Humanities from Dallas Baptist University. He resides in Flower Mound, Texas with his wife, Sheila. They have two children and four grandchildren. Fu graduated from the School of International Relations at the People's (Renmin) University in Beijing and taught English to Communist Party officials at the Beijing Administrative College and Beijing Party School of the Chinese Communist Party from 1993-1996. Fu was also a house church leader in Beijing until he and his wife, Heidi, were imprisoned for two months for “illegal evangelism” in 1996. Bob and Heidi fled to the United States as religious refugees in 1997. As president of ChinaAid, Fu has testified before the Congressional Tom Lantos Human Rights Commission, the House Foreign Affairs Committee, the U.S. Commission on International Religious Freedom (USCIRF), the Congressional-Executive Commission on China, the United Nations Commission on Human Rights (USCHR), the Foreign Press Association, and the European Commission and European Union Parliament. Fu also regularly briefs the State Department and Members of Congress, including Members of the International Religious Freedom Caucus on the status of religious freedom and rule of law in China. In 2008, Fu was invited to the White House to brief President George W. Bush on religious freedom and human rights in China, and in 2011, the Nobel Prize Committee recognized Fu’s efforts. Bob Fu is currently a Ph.D. candidate at Durham University, U.K., graduated from the Westminster Theological Seminary in Philadelphia, and was awarded an honorary doctorate degree on Global Christian Leadership from Midwest University, where he has served as a distinguished professor on religion and public policy. Fu serves as the Editor-in-Chief of the Chinese Law and Religion Monitor, a journal on religious freedom and the rule of law in China, and as a guest editor for Chinese Law and Government, a journal by University of California, Los Angeles. Janet Croswhite Denison grew up in California and moved to Texas during her college years. She is a graduate of Houston Baptist University where she majored in Elementary Education and English. Janet met her husband, Jim, at HBU and they married in 1980. They have two sons, Ryan and Craig. Ryan married Candice Williams in June of 2011 and their daughter, Axia Jane, joined the family in January of 2014. Ryan and Candice live in Tyler, Texas where Ryan is pursuing a PhD in church history with the B.H. Carroll Theological Institute, and Candice is a dentist at Bullard Family Dental. Craig married Rachel Chapman in June of 2012 and their son, Wesley Noah, joined the family in August of 2016. They both work for the Denison Forum. Craig is the author of First15 and the Director of Brand Strategies and Spiritual Formation and Rachel is the Administrative and Marketing Coordinator for Spiritual Formation. Jim and Janet have been privileged to pastor four churches, New Hope Baptist Church in Mansfield, Texas; First Baptist Church Midland, Texas; Second-Ponce de Leon Baptist Church in Atlanta, Georgia; and Park Cities Baptist Church in Dallas, Texas. Jim is now the Founder and President of the Denison Forum on Truth and Culture and Janet is the Director of Spiritual Formation for that ministry. The Denison Forum exists to address cultural issues with moral and biblical truth. The goal is to equip the Church, nationally and internationally, with biblical resource and perspective so they will be “prepared to give an answer” (1 Peter 3:15). Janet is the author of Content to Be Good – Called to Be Godly, a book/Bible study that encourages Christians to work towards a higher standard for their spiritual lives. She has written her first children’s book, Felix Navidad, which is a Christmas story written to remind children of the true meaning of the season. Janet is a popular speaker for church and community events, and a respected Bible teacher. Frank Wolf has been widely recognized as the “conscience” of the Congress. First elected in 1980, he announced in December 2013 that he would leave the House of Representatives at the end of his 17th term to focus exclusively on human rights and religious freedom, with the 21st Century Wilberforce Initiative. In announcing his decision, Wolf said that as a follower of Jesus, he is called to work for justice and reconciliation, and to be an advocate for those who cannot speak for themselves. Wolf also is the author of the legislation to create a special envoy at the U.S. State Department to advocate for religious minorities in the Near East and South Central Asia. Long before the “Arab Spring” turned into an “Arab Winter,” Wolf sounded the alarm about the worsening plight of religious minorities, notably the ancient Christian communities in Iraq, Egypt and Syria. Wolf helped found and served as co-chairman of the Tom Lantos Human Rights Commission, a bipartisan organization made up of nearly 200 Members of Congress who work together to raise awareness about international human rights issues. He has traveled to Ethiopia, Sudan, Sierra Leone, the Democratic Republic of the Congo, Rwanda and other countries in Africa to see firsthand the tremendous suffering due to corrupt governments, war, AIDS and famine. He led the first congressional delegation to Darfur. He also has worked to call attention to the human rights abuses and religious persecution in the People's Republic of China, Tibet, Romania, Nagorno-Karabakh, Chechnya, Bosnia, Kosovo, East Timor and the Middle East. During his time in Congress, Wolf has been honored by a number of organizations for his work on human rights and religious persecution. Among them: the Presidential Eleanor Roosevelt Award for Human Rights; the Christian Legal Society’s William Bentley Ball Life and Religious Liberty Defense Award; the Alliance for Defending Freedom’s Originalism & Religious Freedom Award; Prison Fellowship Ministries William Wilberforce Award; the Faith and Freedom Award from the National Religious Broadcasters; and International Freedom Roundtable's Thomas Jefferson Lifetime Champion Award. In addition to his work on human rights and religious persecution, Wolf has been a leader in a number of other areas in Congress addressing some of the most challenging issues of our time. He is the author of the legislation that created the bipartisan Iraq Study Group, also known as the Baker-Hamilton Commission, which played a critical role in building public support among the American people for the “surge” of U.S. troops in 2007. Wolf was born in 1939 in Philadelphia, Pennsylvania. He received his B.A. degree from Penn State University in 1961 and his law degree from Georgetown University in 1965. He lives in Vienna, Virginia, with his wife, Carolyn. They have five adult children and 16 grandchildren. Wolf wrote a memoir in 2011 entitled "Prisoner of Conscience." Bob’s inspiration has been fueled by the friendships he has developed with others around the world who desire to pursue strategic ways to help people in need. As an attorney, Bob shares leadership in a Washington law firm, Goff & DeWalt. Additionally, he serves as the Hon. Consul for the Republic of Uganda to the United States. He is also an adjunct professor at Pepperdine Law School where he teaches Nonprofit Law, and Point Loma Nazarene University, where he teaches Business Law. Rosemary Trible, the wife of former United States Congressman and Senator Paul Trible, has dedicated her life to public service and the importance of encouraging excellence and leadership among young people. For sixteen years, Paul has served as President of Christopher Newport University, and Rosemary has played an active role in the university and the lives of students. In addition to her public life as First Lady, she is devoted to walking alongside so many young women to inspire them to lead fulfilled lives and empower them to overcome past challenges. She shares not only their joys but also where their hearts are breaking. Rosemary’s compassion to help others move from victim to victory led her to author the newly-released book, Fear to Freedom. It shares her story of redeemed hope and healing through her journey from fear to forgiveness to freedom to encourage others dealing with pain. She formed a global non-profit called Fear 2 Freedom because every two minutes someone is sexually assaulted in America. By partnering universities, churches and community groups with hospitals they are providing after care kits for those going to the hospital after sexual assault or domestic violence. This can make a tangible difference in the lives of those wounded bringing them hope and healing. This last year 928 kits were delivered helping to transform the lives of those abused and restore joy. Rosemary and Paul have two children: Paul Trible, III who has completed his MBA at Oxford University and has a custom men’s shirts business, Ledbury, and Mary Katherine Peters, married to Barrett Peters. Her grandson Lochlan and granddaughter Truitt, just born August 9th, are the joy of her heart. Don Piper, has mesmerized and inspired nearly three thousand audiences around the globe since the release of his New York Times best selling book in 2004. Millions have experienced the 90 Minutes in Heaven story in person, on television, radio, and print media. Don Piper has sold over 5 millions copies of his books in 40 languages. His first book, 90 Minutes in Heaven: A True Story of Death and Life, remained on the New York Times best-seller list for nearly four years! This book, from Baker Publishing Group's Fleming Revell, is widely considered to be a landmark book that has led to a renaissance in the interest of Heaven. Following his radio and television broadcasting career, Don Piper pursued a calling that he had had on his life since adolescence and became an ordained Christian minister. During his service as a pastor, in fact on his way to church, Don Piper was killed in a horrific car crash in 1989. A pastor who was on that lonely highway behind him, felt called by God to pray over Don's dead body and did so for ninety minutes. Others who were told of the accident, but not of Don's death, also prayed. After an hour and a half, as the pastor prayed over Don's lifeless body, Don began to sing a song! Don Piper returned from the gates of Heaven to endure 13 excruciating months of hospitalization, 34 major surgeries, including some never before attempted in the United States, and years of painful therapy and rehabilitation. He now shares his incredible lessons of answered prayer, miracles, overcoming tragedy, pain and loss, and the reality of Heaven. Indeed, each time Don rises to speak, people are astounded that he can even walk onto the platform. But he does and those in attendance are simply not the same after he concludes his presentation. Around the world Don Piper has shared the story of hope and healing. He's appeared on NBC's Today Show, Dateline NBC, ABC's Nightline, FOX Network's Sean Hannity's America, and The O'Reilly Factor. A frequent guest on Trinity Broadcasting's Praise the Lord and Christian Broadcasting Network's 700 Club, Don has also appeared on D. James Kennedy's Coral Ridge Hour, and Life Today with James Robison, among many others programs. He's also been interviewed by literally hundreds of radio stations, newspapers, and magazines all over the world. Don has released three additional books: Daily Devotionals: 90 Readings for Hope and Healing in 2006; Heaven Is Real: Lessons on Earthly Joy in 2007; and Getting to Heaven: Departing Instructions For Your Life Now in 2011, all from Penguin-Putnam. Don Piper is known around the world as, "The Minister of Hope." He founded Don Piper Ministries, a 501-c3 entity, in 2007, to channel revenues from book sales and speaking income to help over 40 ministries here and abroad. Don's home is in Pasadena, Texas. He has been married to the former Eva Pentecost since 1973. They are the parents of three children, a daughter Nicole and twin sons, Chris and Joe. Eva and Don have two grandchildren, Carlee and Will. He walks today as a result of miraculous and medically unexplainable events. He has inspired millions and if you are led to invite him to share with your event, he will lift your audience to a new level of hope and determination! Dr. Jim Denison pastored Park Cities Baptist Church in Dallas, Texas for ten years prior to founding the Center for Informed Faith. Previously, he has pastored churches in Midland and Mansfield, Texas, and Atlanta, Georgia. His daily devotional, "God Issues: Today’s news in spiritual perspective” is made available across the world to more than 14,000 readers. He and his wife, Janet, have two sons.